Not for Sale? Currently, no shop in Germany is selling the new HP Pavilion dv6 in our test configuration, although both its price and hardware seem very interesting. 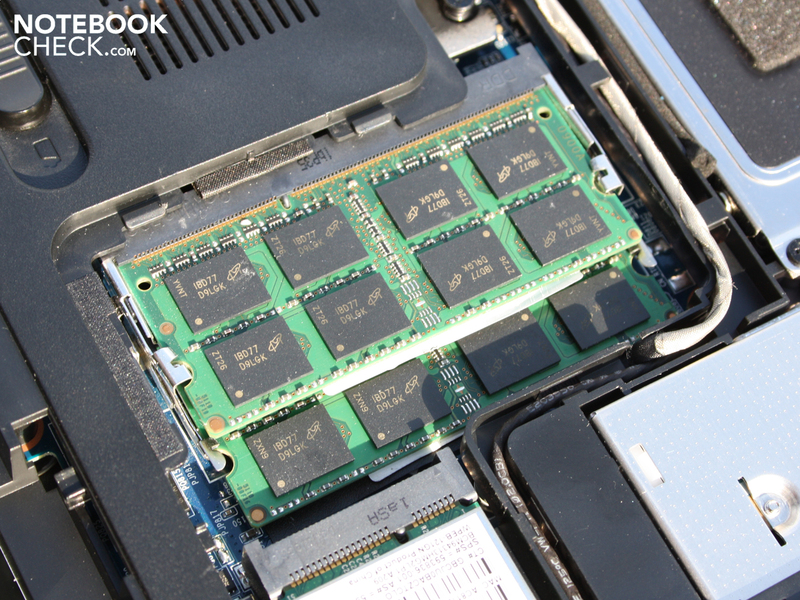 The HD 6770M graphic chip of the notebook promises gaming power. In addition, the quad-core CPU and 8 GB RAM should deliver great performance. Still, is it worth the wait? 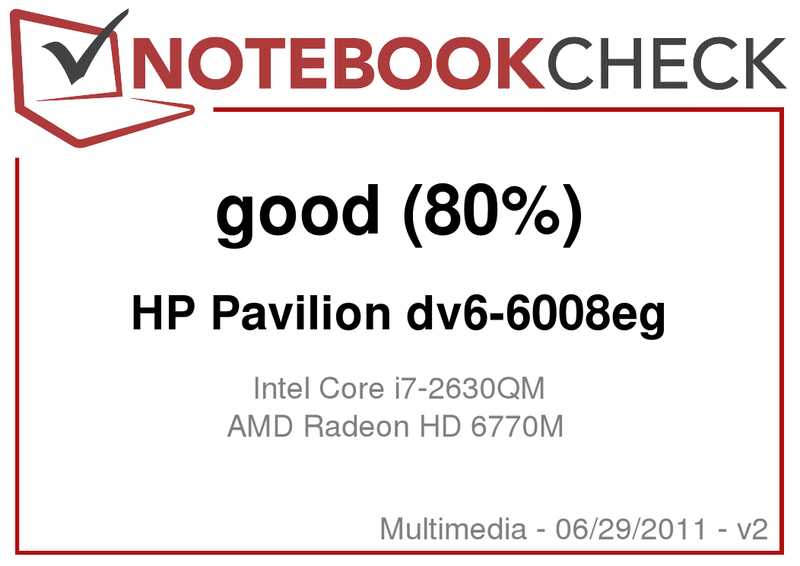 HP Pavilion dv6-6008eg (LQ765EA): cheap quad-core power and good game performance? 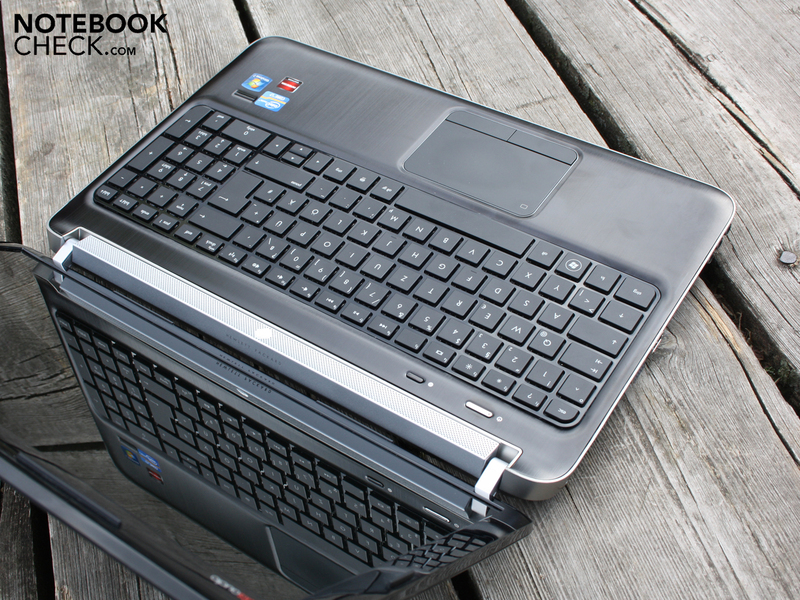 If buyers love one thing, it is laptops which offer great performance for a low price. With its new Pavilion dv6 models, HP (the US-based manufacturer), introduces a new range of laptops which will be sure to attract buyers who are looking for gaming notebooks in a price range of 600 to 900 Euros. The 2011 dv6-6xxx series will be equipped with the AMD Radeon HD 6770M graphic card, which offers significantly more performance than its mainstream Nvidia competitor, the GeForce GT 540M. Notebooks equipped with the afore-mentioned GeForce graphic card lie in the same price range as our test model. The new laptop is equipped with a quad-core processor (the Core i7-2630QM - 4x 2.00GHz), which is supported by a large amount of RAM, to be exact: 8,192 MB. All this is available for a price of 799 Euros - currently a very aggressive pricing. All-in-all, this offer will be sure to attract many buyers interested in good performance. Unfortunately, right now the new dv6 models, with the Radeon HD 6770M graphic chip and the (2011) i3, i5 and i7 processors, are only available at online shops. 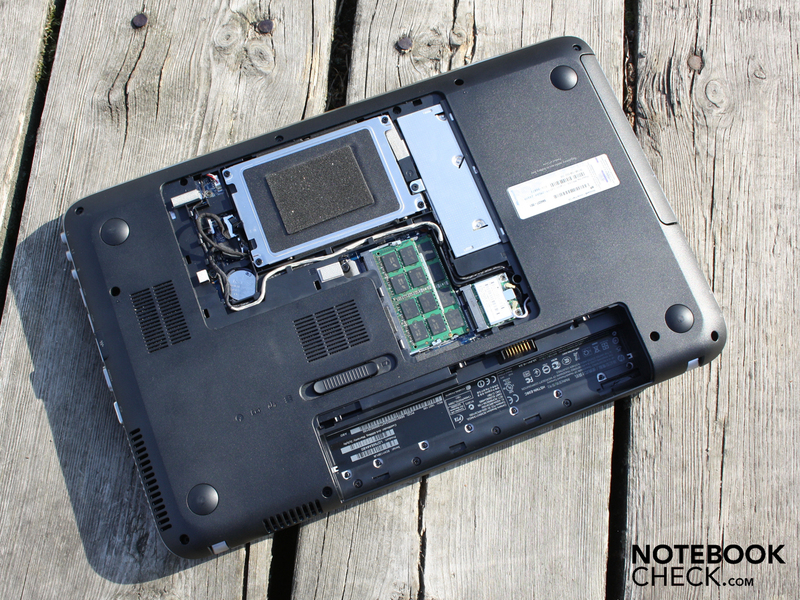 In the following review, we will take a close look at the performance and other important factors (such as emissions, sturdiness, sound quality, etc) of the multimedia notebook, the HP Pavilion dv6-6008eg. One look at the Pavilion dv6-6008eg is enough to reveal its elegant, almost extravagant design. 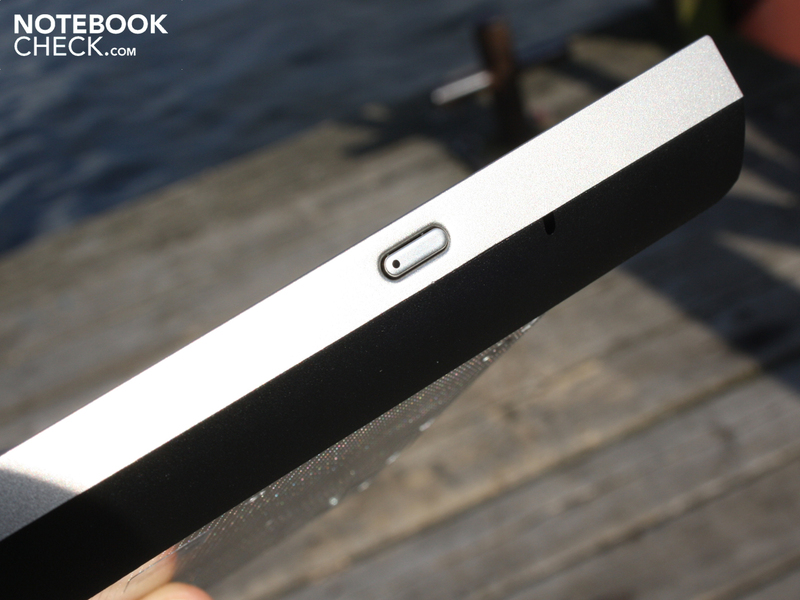 The matt aluminum cover has a brushed finish and is pleasantly cool to touch. 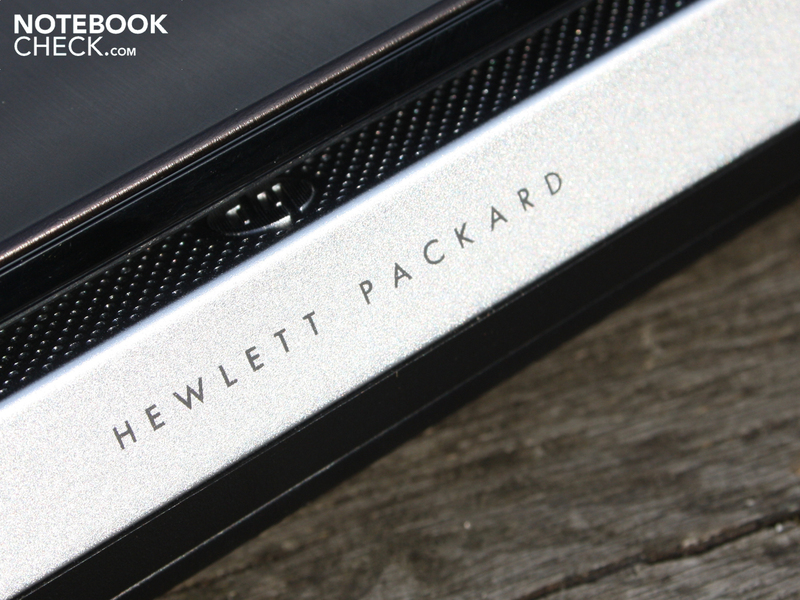 Another nice feature is the lighted HP logo which effectively enhances the otherwise plain cover. 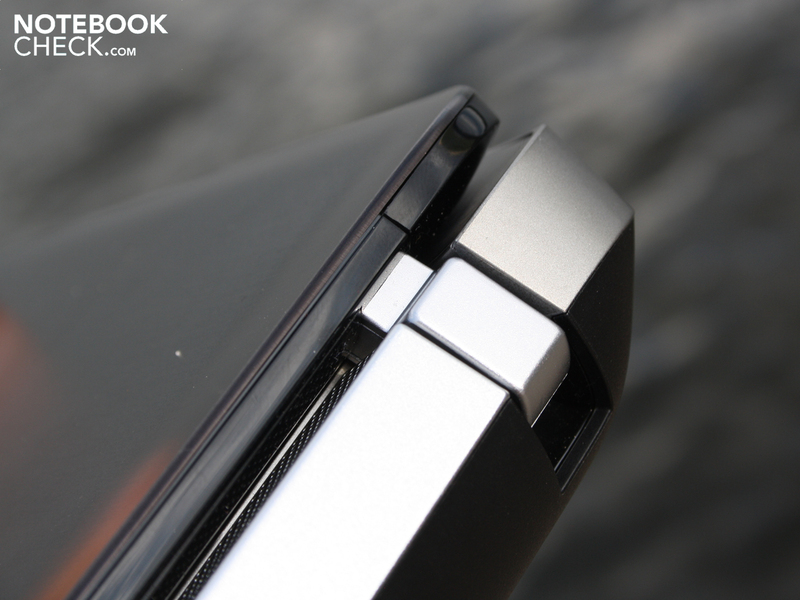 The notebook has a nice shape and metallic haptic. The material used gives a high quality impression. The display bordering and the screen are not the only elements with a glossy surface. In fact, the matt keys of the keyboard are nicely arranged on top of a glossy surface. The hinges hold the display securely in place, and have a metal covering. The base unit is not very resistant. 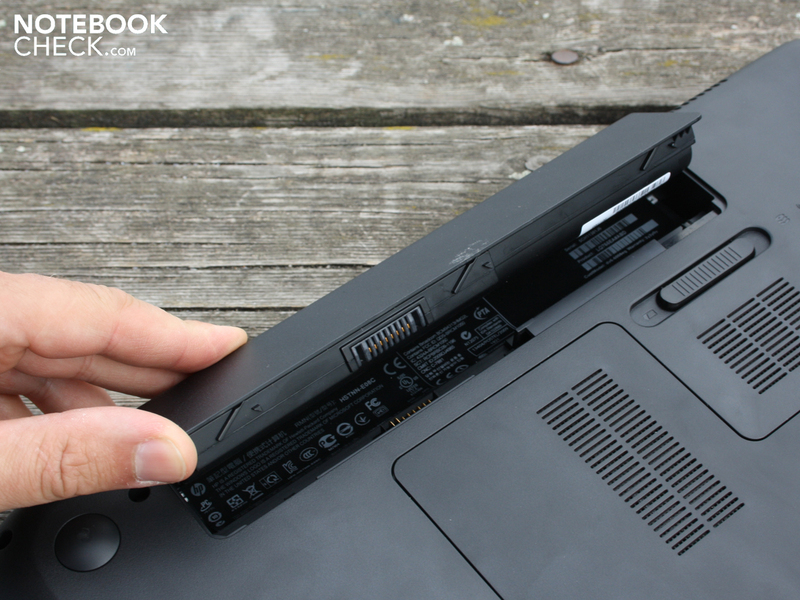 We could easily bend the chassis inwards by placing both hands on the laptop and applying a little force. The areas above and below the optical drive are susceptible to pressure. 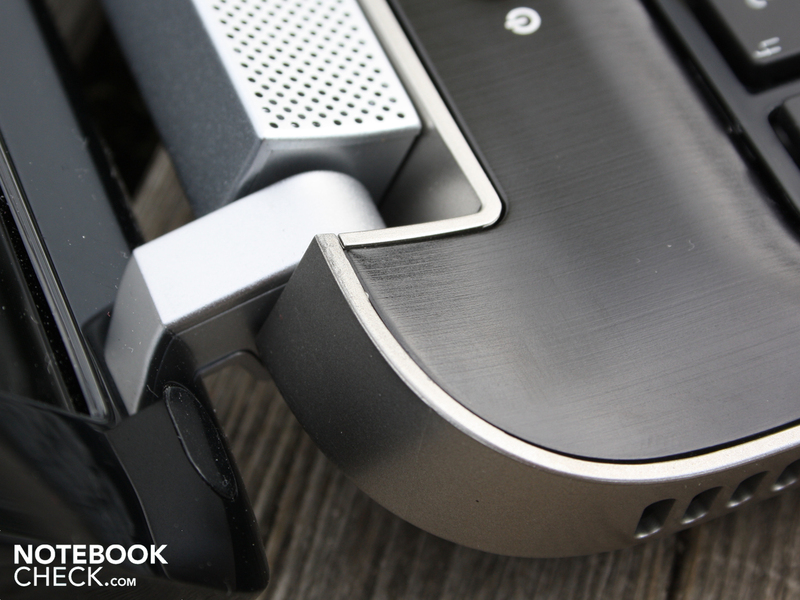 The gap between the front right speaker and the aluminum hand-rest can also be bent easily. The plate beneath the keyboard is absurdly weak and can be noisily bent inwards everywhere. In short: the workmanship is very good, but in some areas major flaws are noticeable. Overall, the design is not very consistent. 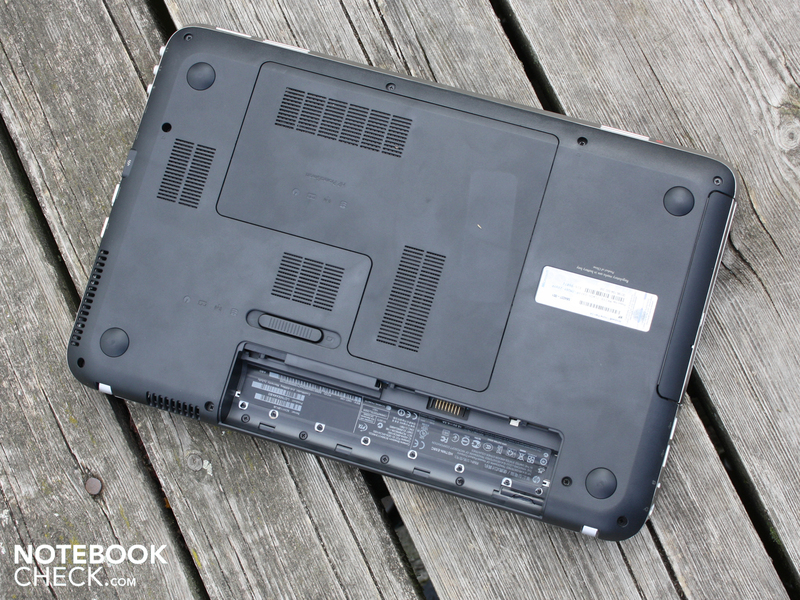 The bottom of the laptop reveals multiple openings for ventilation purposes. These openings can also very susceptible to force. A panel on the bottom protects the HDD, RAM, WLAN module, and DVD-LW drive below. Thankfully, no screws need to be removed to take off this panel. The user just needs to push the battery release button in the opposite direction with a little force to pop the panel out, after which, it can be easily removed. Users who want to connect their external eSata hard disk or an old ExpressCard34 TV card will be disappointed. However, two USB 3.0 ports are available for any other external devices. External monitors can be connected to the laptop via the HDMI or VGA ports. Unfortunately, adding a FireWire port or a 7.2 sound output will not be an option with this laptop. The positioning of the ports can prove to be both good and bad. USB, 3x audio, Ethernet and HDMI interfaces can all be found on the front left side and are easy to reach, but the mess of wires, which will be created when these ports are in use, will inevitably crowd the workspace. 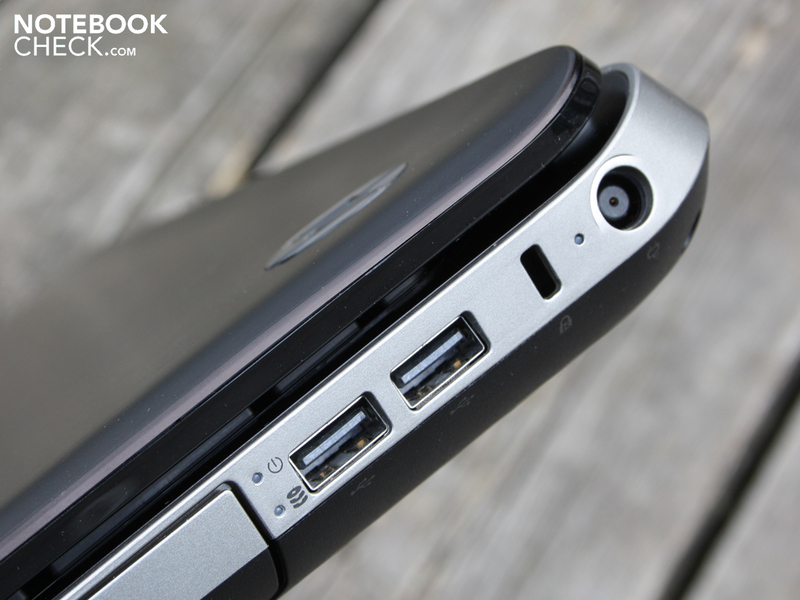 On the right side of the laptop we have two USB 3.0 ports and the power outlet, which are both placed quite far back. This allows for the connected cables to be wound around the back of the laptop which will save space. A Broadcom chip supports the fastest Draft-N WLAN Standard (WLAN 802.11bgn). An integrated Bluetooth module is not on board, but the Realtek network card does support Gigabit Ethernet. 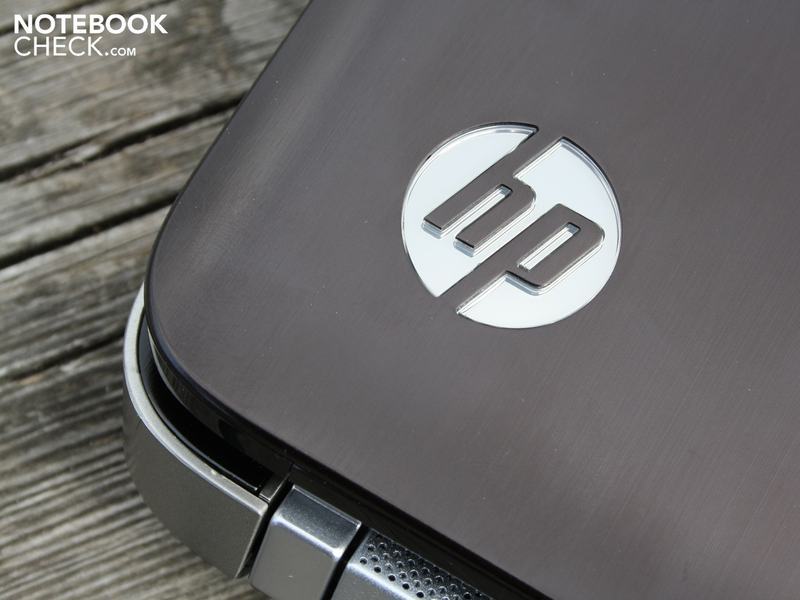 Long ago, HP decided to stop including recovery DVDs with new laptops. As such, the package offers no other accessories besides a short intro manual. Thankfully, the Recovery Manager is available for the creation of backups. Other tools, such as the Power Manager, which can be used to configure the energy profiles, and CoolSense, which controls the cooler fan speed (See "Emissions"), are also provided. The Catalyst driver allows the user to manually switch between the Intel HD and HD 6770M graphic chips. Undesirable software (such as, Norton etc.) can be avoided by removing a few ticks from the menu which appears at the first start of the laptop. Many users will welcome this option. HP offers 24 months manufacturer warranty for the dv6 with pick-up and delivery service. A premium of 99 Euros can secure an additional year (3 years in total) of Pick-Up & Return service. The keys have a good pressure point and a large stroke distance. HP integrates a numeric pad which should allow easy input of numbers. 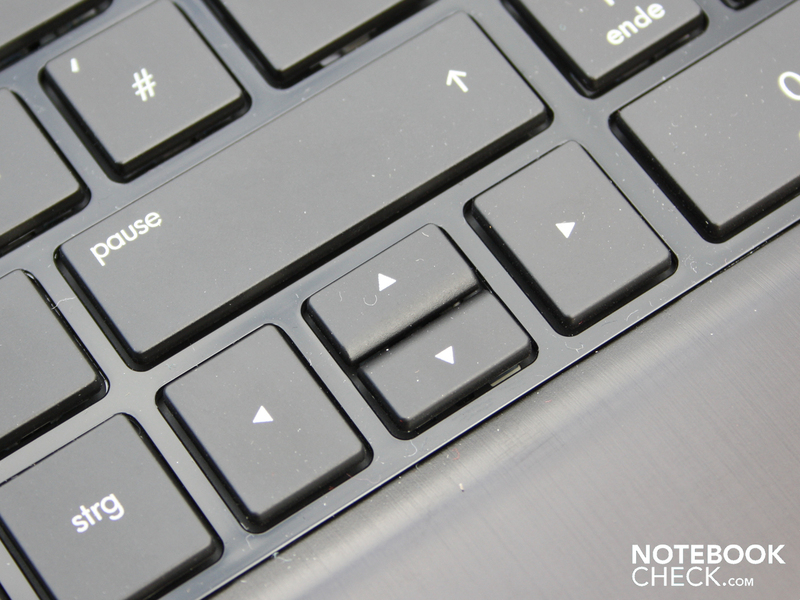 The cursor keys are also easy to use thanks to their good size (they are as big as the letter keys). The few good aspects of this keyboard are easily blighted out by the spongy keys and the weak base which gives way almost everywhere. The slightest tap of a key is enough to confirm the rickety typing feel. 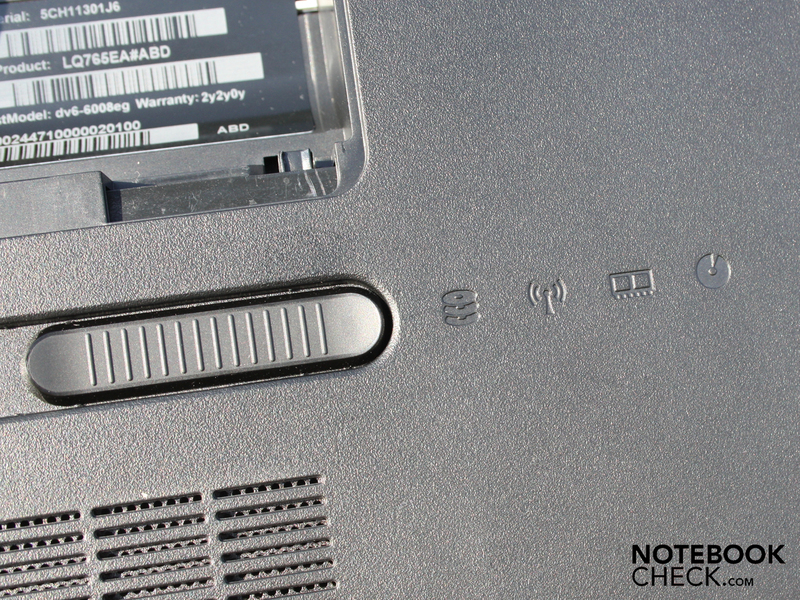 The Synaptics multi-touch device (Synaptics V7.5) has a light sensor on the top left (marking). If this spot is covered during typing, then the touch surface is deactivated so as to prevent unintentional input. Manually switching off the touchpad is not possible due to the missing Fn key combination. 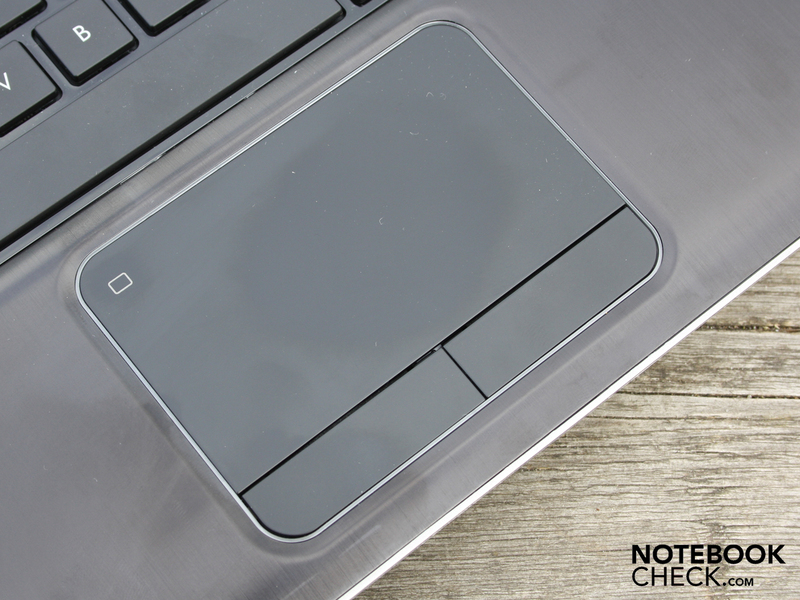 The relatively smooth surface of the touchpad is sunk into the aluminum hand-rest. 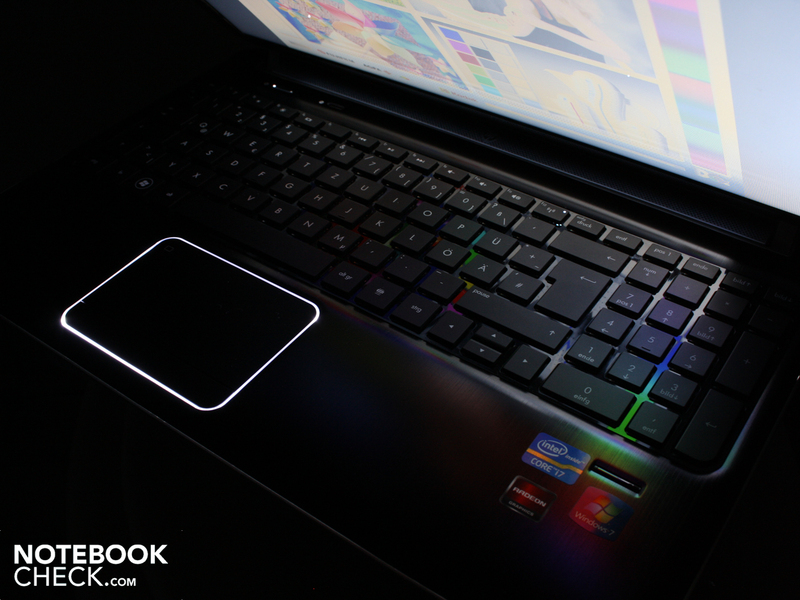 The touchpad is surrounded by a constantly glowing white ring. We could not find a way to deactivate this. The keys of the touchpad differ in loudness depending on their position. The medium stroke distance combined with a palpable pressure point gives the user a good feedback and ensures fast and easy use. The reflecting CMO panel (Type: N156B6-L0B) has a resolution of 1366 x 768 pixels (WXGA, 16:9 format). This native resolution is rough for the 15.6 inch laptop but it is standard for notebooks under the 800 Euros range. We think that the use of such a native resolution is questionable. The installed HD 6770 graphic chip can even run some of the latest games in high resolutions (See the "Gaming Performance"). A WXGA+ (1.600x900) display would improve the dv6 significantly. The CMO panel has a low contrast of 192:1. However, this is standard for typical office or multimedia notebooks. 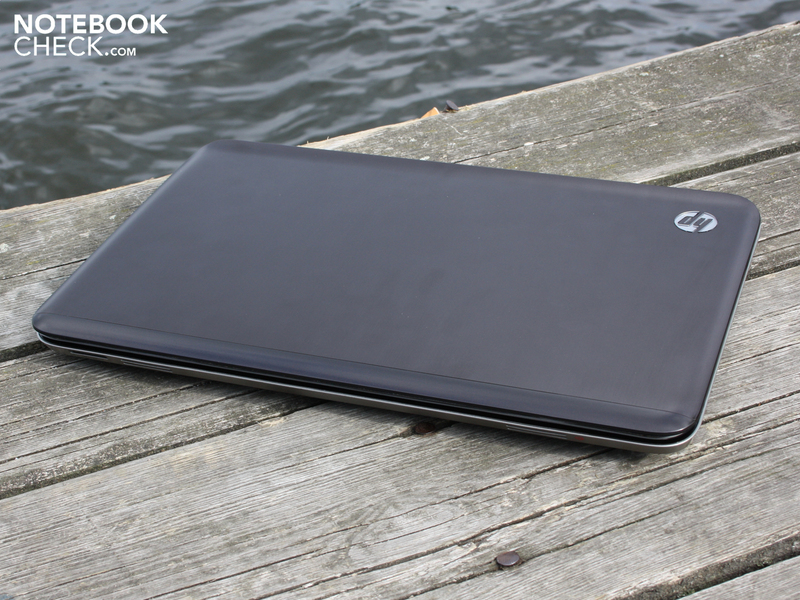 Most of the consumer notebooks we tested (about 90%) could not offer a better contrast than 200:1. A great contrast would be something between 400:1 to 1000:1. The term contrast describes the white portion of a black surface. As such, the black offered by the dv6 is not very crisp and seems dark. The reflecting glare type panel improves the low contrast picture somewhat. Colors seem slightly stronger in reflective panels than in their anti-glare counterparts. We were not surprised by the small color space. 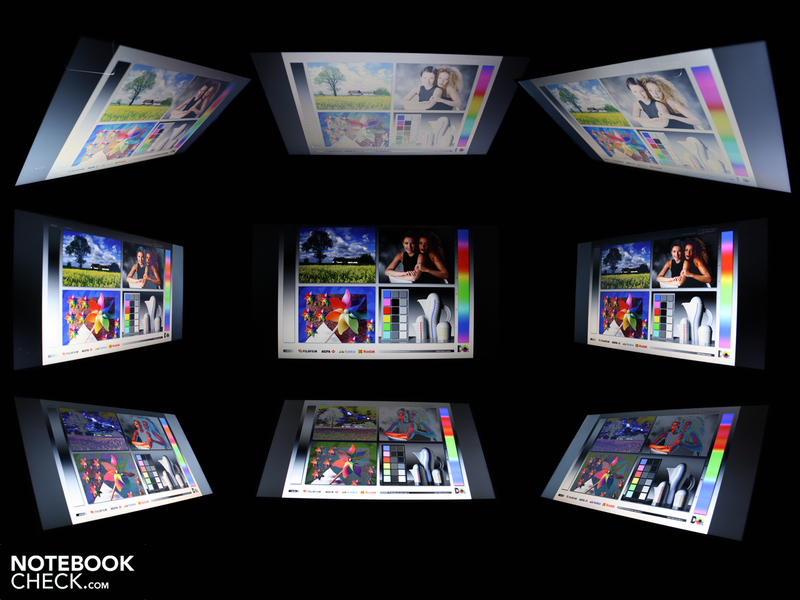 The sRGB color space is not covered. 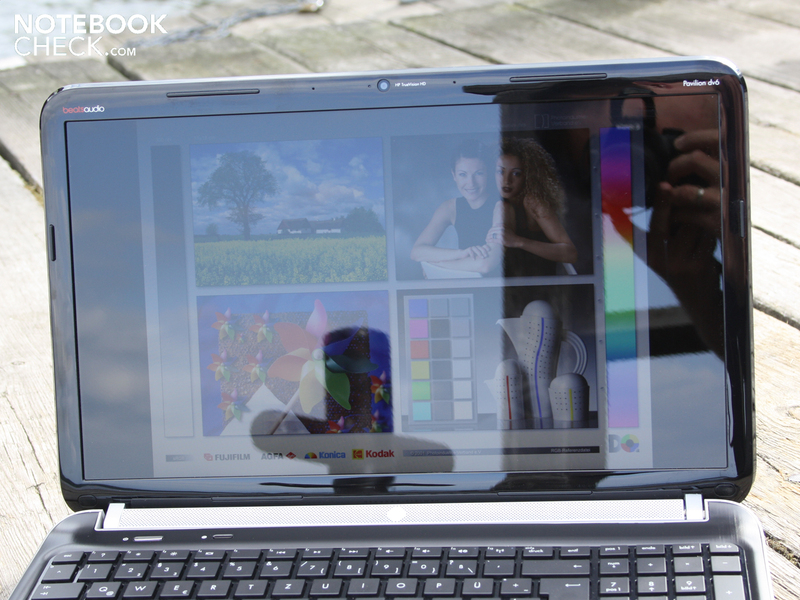 Professional displays, such as the panel of the Vaio F21Z1EB, cover more colors. However, there are notebooks which have even smaller color spaces: Vaio F13. Thankfully, the everyday user will not be troubled in any way by the restricted color space. The brightness values we measured from the display seem good. On average the brightness was around 217 cd/m². The illumination is well-balanced at 88%. The TFT does not cross the 230 cd/m² mark at any point. 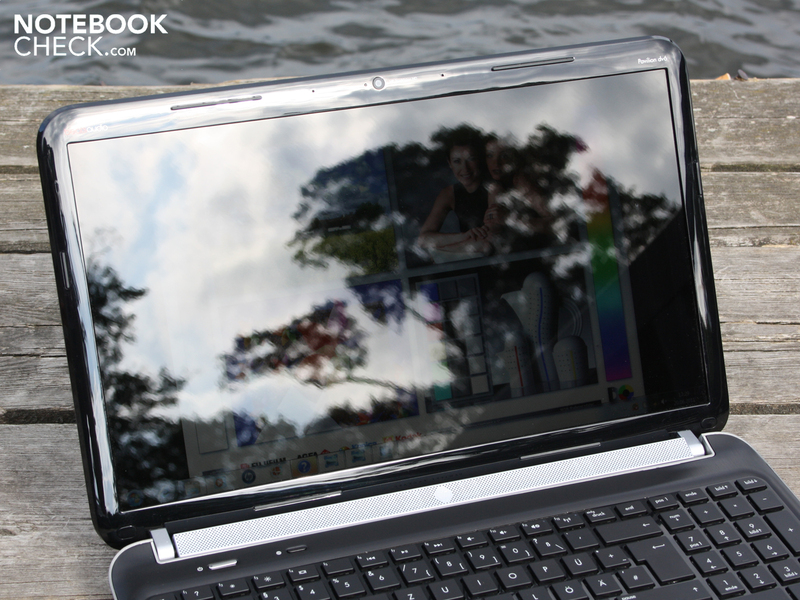 A trip outdoors with the Pavilion dv6 shows that the laptop is not in its element outside in the sunshine. There are two reason for this. First: the dark case heats up relatively quickly. Second: the glare type panel will cause a myriad of distracting reflections. The maximum brightness of 228 cd/m² will suffice for indoors use, but outdoors the laptop remains dark. 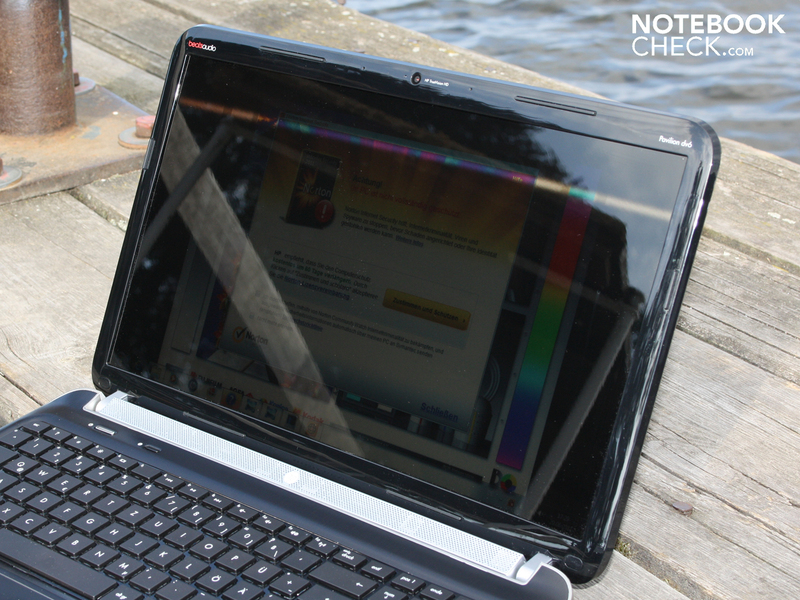 Multimedia notebooks need broad viewing angles so that viewers can see text and colors clearly from various viewing angles. 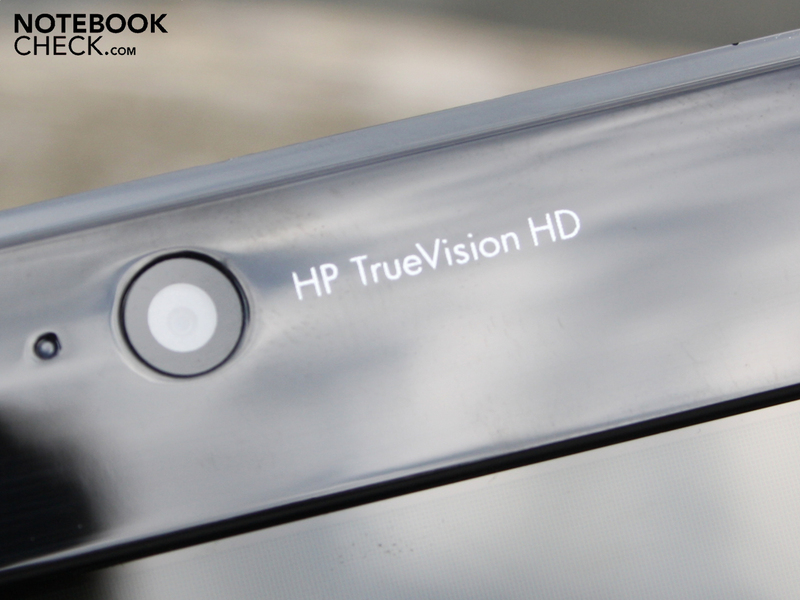 Horizontally, the viewing angles stay decent up to 45 degrees, after which the colors distort significantly. Anyone who looks at the display from above or below during this distortion will realize just how small the vertical viewing angles are. Vertically the color distortion can be noticed after a deviation of 10 degrees. As the viewing angle changes, colors are quickly washed out. Our viewing angles video will show just how restricted the viewings angles really are. The quad-core Core i7-2630QM with 4 x 2.0 GHz (Normal speed) is well-known for its strong system performance, as seen, in the Deviltech Fragbook DTX (Clevo P170HM, GTX 470M), the Asus G73SW (GTX460M), and the Fujitsu NH751 (GT 525M). Turbo boost allows the CPU to overclock to 2.9 GHz (one core). See our CPU details. The integrated HD Graphics 3000 ensures good battery life thanks to its low power consumption. The AMD Radeon HD 6770M (1.024 MB) graphics chip can switch to the afore-mentioned integrated graphic chip either manually or automatically when the laptop is put into battery mode. This will decrease temperature emissions and increase run time. The Cinebench R11.5 CPU test (multi-core, 64 bit) showed a great result of 4.83 points. 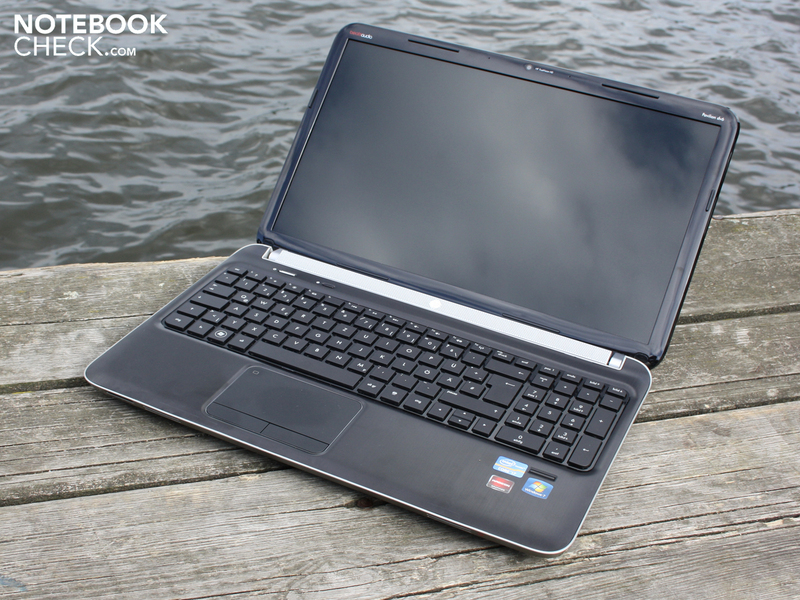 This is a lot more than its predecessor, the 740QM (3.4; MSI GX660R), could score. 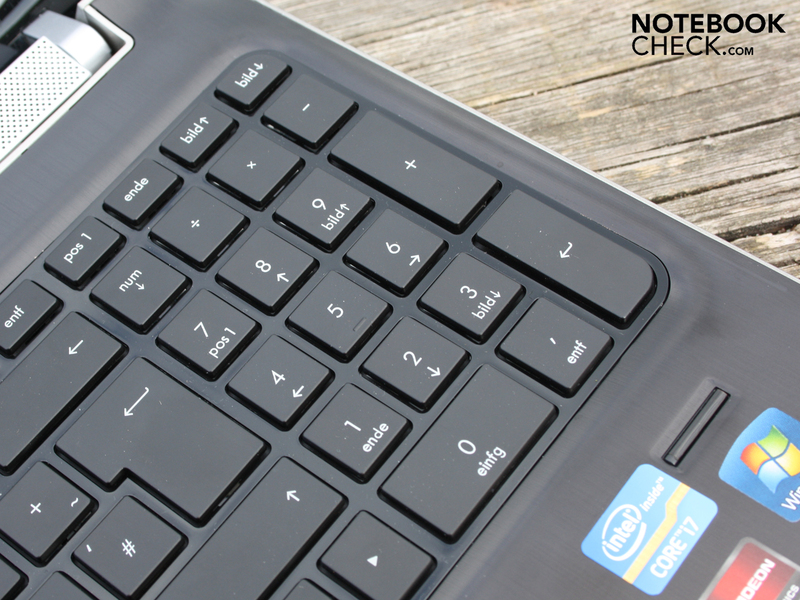 The "identical" i7-2630QM in the Aspire 7750G or Asus G73SW-TZ083V could score even more: 5.0 points. This is due to better use of the Dynamic Frequency (Turbo 2.0) technology. The worst score of 3.9 points was achieved by the Acer Aspire Ethos 8951G. Depending on whether the cooling bodies are hot (previously under load) or cold (previously running in idle mode), the R11.5 score of the dv6 ranged between 4.83 and 4.48 points (7% difference). PCMark Vantage calculated a score of 7253 points for the dv6. This score is only topped by gaming builds such as the Asus VX7-SZ062V (GTX 460M, 8657) or the MSI GT780R (GTX 560M, 8599). A stronger GPU might not increase the score, as is shown by the Acer Aspire 5750G-2634G64 (7777) and the Sony Vaio VPC-F21Z1E/BI (7312), both of which have the weaker GT 540M. We also ran the PCMark 7 benchmark which gave a result of 2283 points. Current i7 quad-core systems with a similar middle-class GPU, such as the Lenovo IdeaPad Y560p (2630QM, HD 6570M), lie around the same level (2137). As soon as a SSD comes into play, such as in the Acer Aspire Ethos 8951G (GT 555M, 3430), the overall performance rises significantly. Synthetic benchmarks, such as Unigine Heaven 2.1 (17fps), show that the performance of the AMD Radeon HD 6770M is identical to that of the Nvidia GT 555M. A 3DMark11 test showed that the Radeon chip (1560 points) ran slightly faster than the GT 555M (1313 points). A GeForce GTX 460M scored 1789 points (Medion Erazer X6811-MD97624, i7-740QM). The 3DMark2006 (1.280 x 1.024) benchmark revealed a final score of 10,762 points for the Radeon HD 6770M, while the GT 555M has a very similar 11,147 points (Dell XPS 17-L702X). Systems with the afore-mentioned GeForce graphics card cost at least 950 Euros (see Alienware M14x, Aspire Ethos 8951G or Schenker XMG A501 - W150HRM). The highlight of the dv6-6008eg seems to be the 7200 rpm hard disk from Hitachi (500 GB, HTS725050A9A364). The hard disk has a sequential read speed of 76.5 MB/s (HD Tune). This is an exceptional value for a 2.5 inch notebook HDD. The Crystal DiskMark 3.0 recorded a value of 88 MB/s (read/write) using a different test method. Again, an exceptional value for a 2.5 inch hard disk. The HDD score in PCMark Vantage lies at 4431 points. 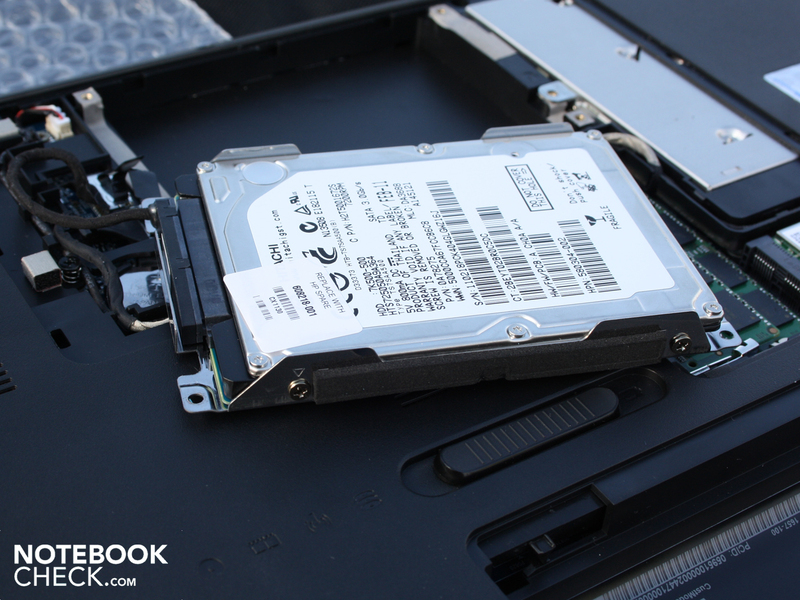 The dv6 can be sped up further with the use of a SSD. 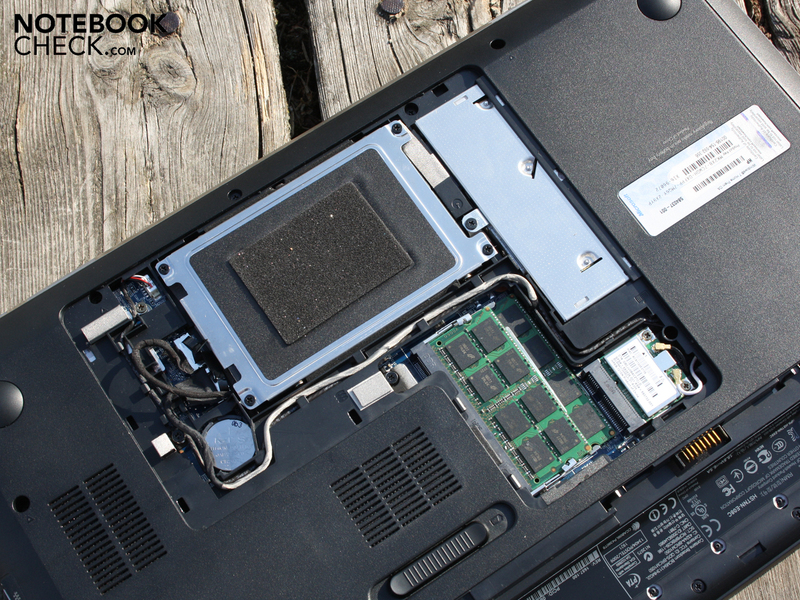 The Acer Aspire Ethos 8951G scored 23,713 points with an SSD (read: 169 MB/s). The activity LED for the hard disk is barely visible on the right side of the case between the DVD-LW drive and the USB port. The AMD Radeon HD 6770M (1024 MB) is a DirectX-11 GPU, which is based on the same Whistler chip (incl. 128 bit memory interface) as the ATI HD 6700M and 6600M series. The card offers a higher core frequency of 725 MHz. Tests of this graphics card are rare so far, and HP is the only manufacturer using this GPU. In the adventure game Risen, the GPU manages to keep up with a GT 555M. Both cards delivered 53 to 52 fps with the same processor (medium details). In high details, the GT 555M took the lead (by 3% - High 37 fps). The famous shooter game from 2010 can be run in the highest resolution (native) and high details on the dv6. The graphic card runs the game fluidly at 48 fps which indicates that an external display with WXGA++ or something similar could be used without a significant drop in the gaming experience. The GT 555M is 15% slower in this game and the HD 6770M lies slightly behind the GTX 460M. Anyone who enjoys this space strategy game will be happy to know that the dv6 runs this game with the highest details at a perfect 45 fps. A GT 555M is on average 10% slower (Schenker XMG A501; 42 fps). The popular GT 540M is 17% slower. The game runs without any problems at 55 fps in the native resolution of 1366 x 768 pixels. In this game, the HD 6770M is slower than the GT 555M by 15% (high details). However, the well-known GT 540M is 21% slower than the Radeon Hd 6770M. The graphic card is in the green zone for all of our four test games from the years 2009 and 2010. So we can conclude that the dv6 with the Radeon HD 6770M is well-equipped for the latest and older games alike. High details with the native resolution (1366 x 768) is not a problem for the laptop. In some games, the laptop has enough juice left over to run the game on an external display with a higher resolution of 1600 x 900 pixels. The Nvidia alternative (the GT 555M) offers similar performance but is much more expensive. 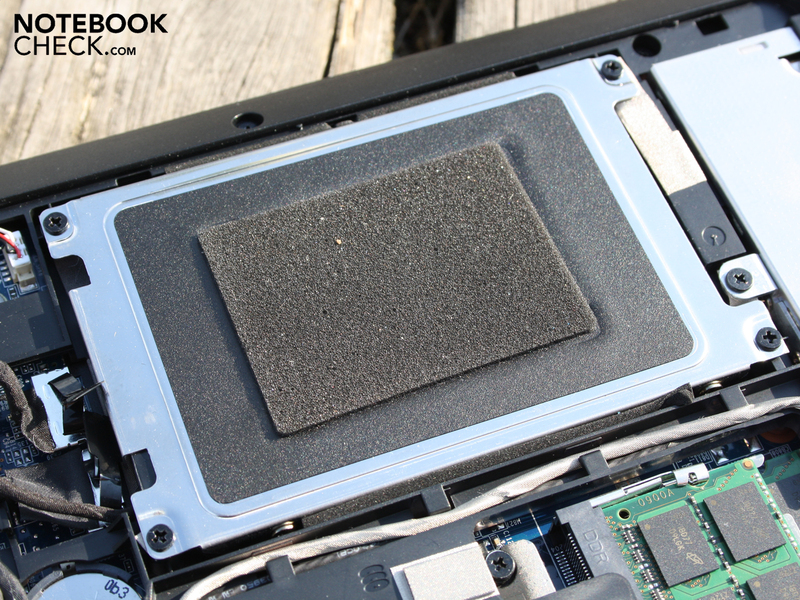 High performance notebooks are allowed to be loud now and then. The cooling fan emits up to 43.5 dB(A) (measured from a distance of 15 cms from the case edge) while running 3D benchmarks and games. While the laptop is in office use the emissions are far lower, so those users who do not push the notebook for performance will be happy with the low emissions ranging from 32 to 36 dB(A). The cooling system is always on, and the cooler fan is always running. We measured a noise emission of 47.2 dB(A) in a stress test (Furmark and Prime95 simultaneously). This value is worrisome because it is quite high and the cooling system did not stay constant at this level. Instead, it kept turning up and down between 40 and 47 db(A). Thankfully, this last case is only applicable in an unrealistic high-load scenario. The CoolSense tool can be used to regulate the cooling system and thus decrease the noise emissions. However, this will cost the user a bit of performance. Running games in the "Quiet Mode" causes significantly lower emissions. We ran the game "Risen" with high settings with this mode and noticed a decrease of noise levels from 43 to 37 dB(A). We did not notice any effects on performance. However, Turbo Boost is much less effective in both the "Quiet" and the "Cool" modes. See the screenshot gallery. Games and benchmarks were all run in the "Performance" mode (default). In the stress test we tried out CoolSense and noticed a throttling from 2.0 (normal) to 1.6 (throttle). See our screenshot gallery below. 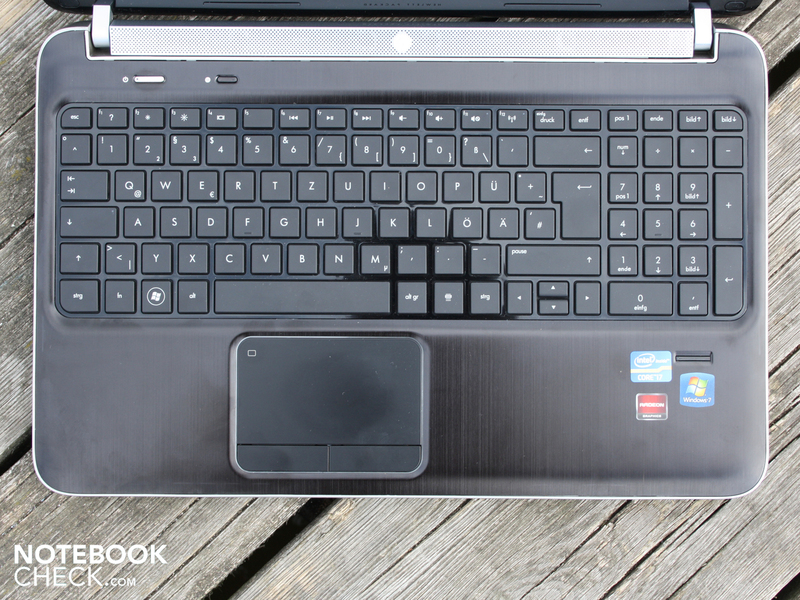 The top of the laptop can warm up to 37 degrees while playing games (on the left side near the keys). The temperature lies around 32 degrees on average as the other parts of the surface stay much cooler (especially the right side of the notebook). The temperatures are significantly higher in the region of the cooler fan, we measured up to 48 degrees in this area. 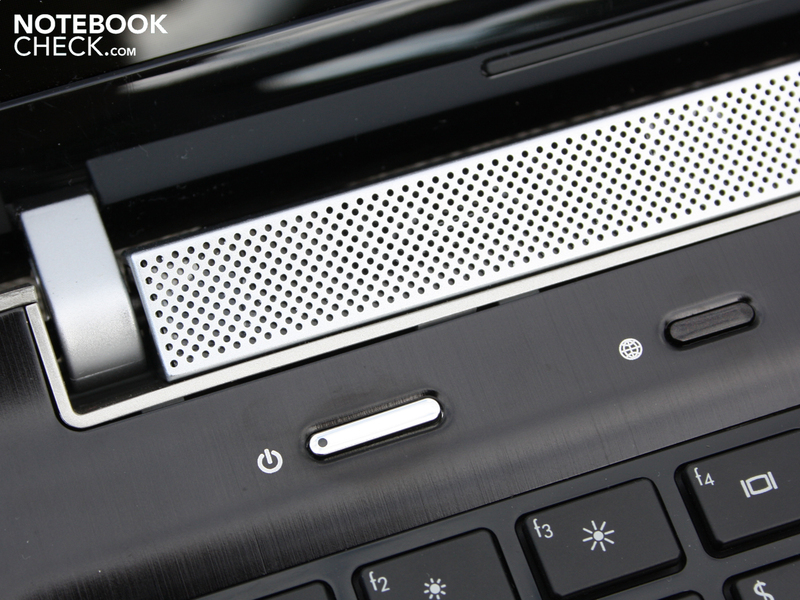 Users should leave the ventilation openings on the bottom of the laptop free while playing games. The feet of the laptop are very flat, which means that playing on a table cover or on a bed sheet is a bad idea. Time and again we notice a throttling of the CPU frequency in laptops. 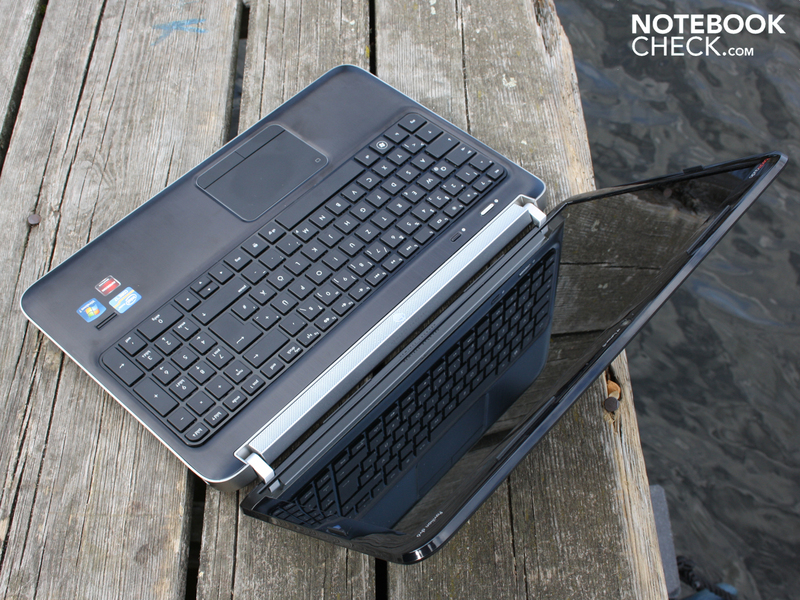 See, for example, our review of the Acer Aspire 3830TG. When the Core i7-2630QM (4x 2.00GHz) is stressed out in the Prime95 benchmark and the HD 6770M is simultaneously running the Furmark benchmark (stress test), we notice that after about 15 minutes of this ordeal, the CPU throttles down to 2.0 GHz (x4 cores). See screenshot of the "Core Temperature" (HWinfo clock frequencies). As long as Prime95 is running alone, the throttling problem does not appear (4x2.1 GHz). As the thermal throttling only appears after the notebook has been running under heavy load for a long period of time, the performance of the laptop in games and programs should not be affected. The throttling problem did not pop up again even when we ran the 3DMark2006 benchmark for multiple hours. However, it is important to have the right cooler fan settings (see above "Noise Emissions"). Turbo 2.0 works in essence. We tested it out by running a multi-core Cinebench R11.5 benchmark. Benchmark (cold, no stress before): 4.83 points. Benchmark (hot, after stress test): 4.48 points (-7%). Explanation: in the first few seconds the CPU overclocks above its usual Turbo speed. However, the temperature also rises quickly, which means that the high clock speeds can not be held and the CPU clock frequency decreases. Two speakers (medium and low pitch) are placed on top of the keyboard while another two (high pitch) are placed at the front of the laptop. The result is a good sound output, highs and middles in the music are balanced. While listening to the output we could easily tell that the high pitch emanated from the front speakers. The low pitch from the speakers above the keyboard contributes to the bass, which could have been stronger. 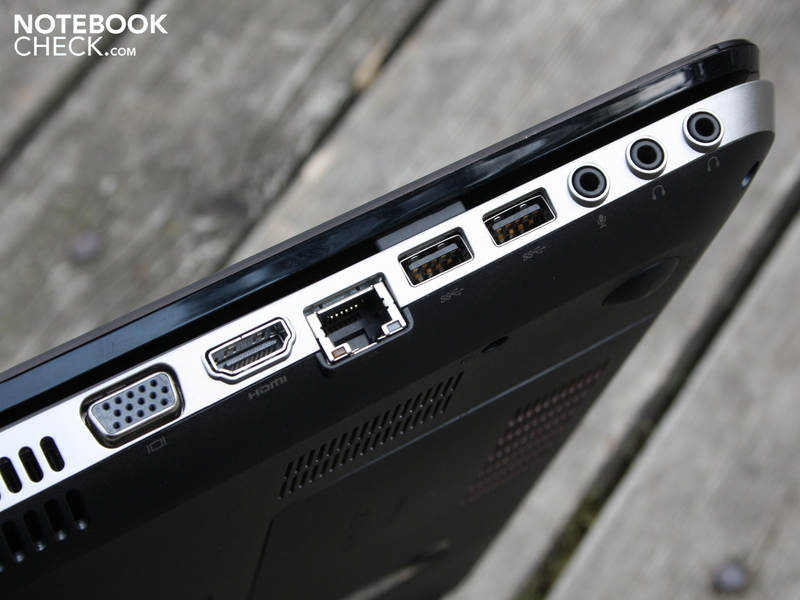 Nice idea: there are two headphone jacks in this laptop which allow two sets of headphones to be used simultaneously. The long run times when the laptop is idle or while surfing using the WLAN indicates that the dv6 consumes very little energy. Our multimeter confirms this fact. The power usage when the laptop is idle ranges between 12 to 20 W. We measured both the lowest power usage component (Intel HD 3000) and the highest energy consuming (HD 6770M) each during idle use and measured this against the battery capacity. The stress test told a different story (Prime95, Furmark): 113 W. The power consumption lies at 69 W when the HD 6770M (3DMark06) is processing on its own. Throttling during CPU and GPU simultaneous processing exists (See "Noise Emissions"). No matter which energy saving mode is picked, the 120 W power adapter deals with it without any problems. The 6-cell Lithium-Ion battery has a capacity of 55 Wh and delivers surprisingly good run times. The laptop can run for 4 hours and 20 minutes while surfing using the WLAN. Anyone who wants to watch DVD films on the go can do so for a total 3 hours and 42 minutes. That is enough run time for around two films. 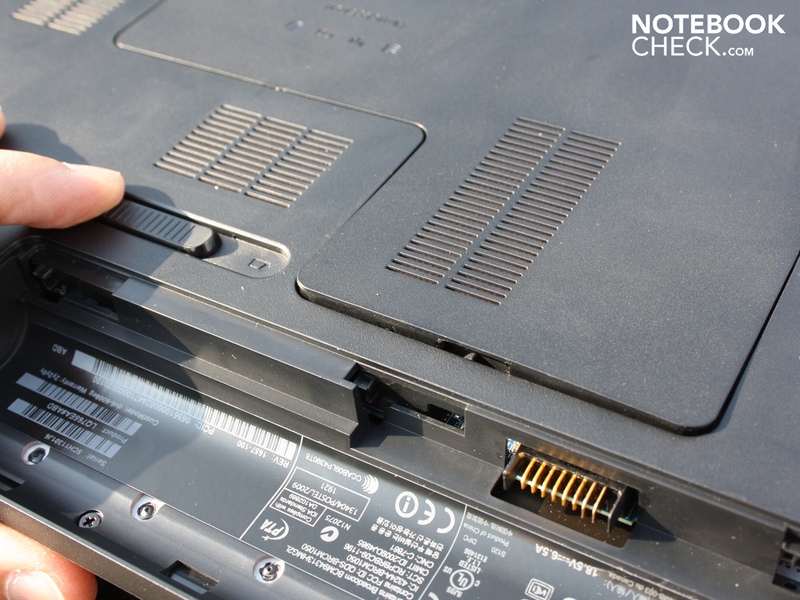 Users who leave the laptop in idle mode can extend the run time up to 5 hours and 51 minutes (BatteryEater Reader-Test). The Intel HD graphic chip was active in all these three tests, whereas the dedicated HD 6770M was deactivated. Under heavy load of the processor, the system can consume up to 80 W (for example, Prime95). The full stress test using BatteryEater Classic ended after one hour due to this high power usage. 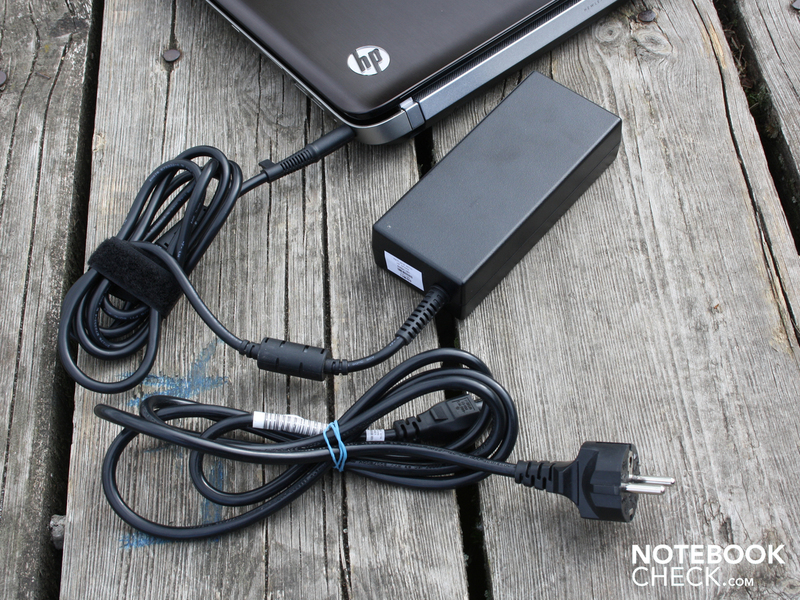 The heavy 120 W power adapter requires 2 hours to recharge the notebook completely. The energy schemes can be configured in the HP Power Manager. Window's energy-saving schemes are replicated in this tool to quite an extent. 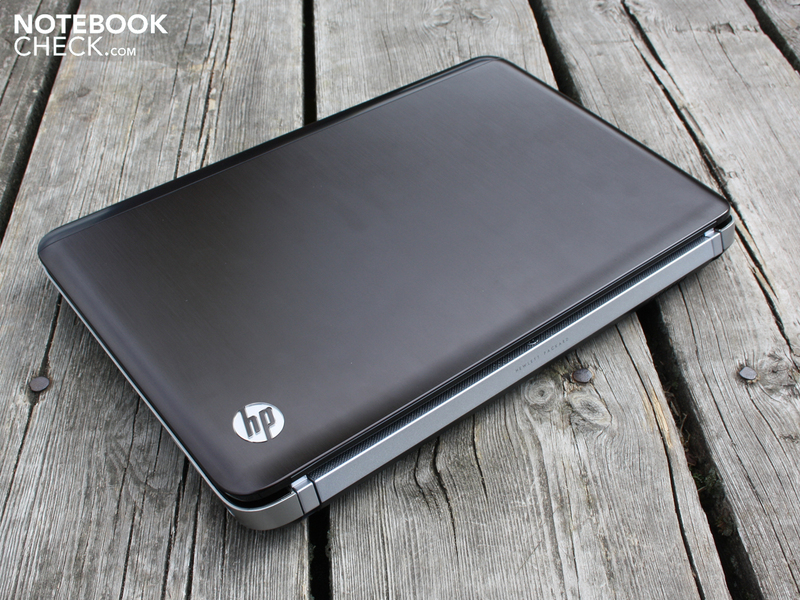 The brand new versions of the HP Pavilion dv6 are available at online shops. Our review shines light on a few of the configurations available for the dv6 models, although our test configuration, the dv6-6008eg (LQ765EA), is rare to find. The cheapest configurations are equipped with a Core i3-2310M and are available for less than 600 Euros (dv6-6007sg, LH778EA). 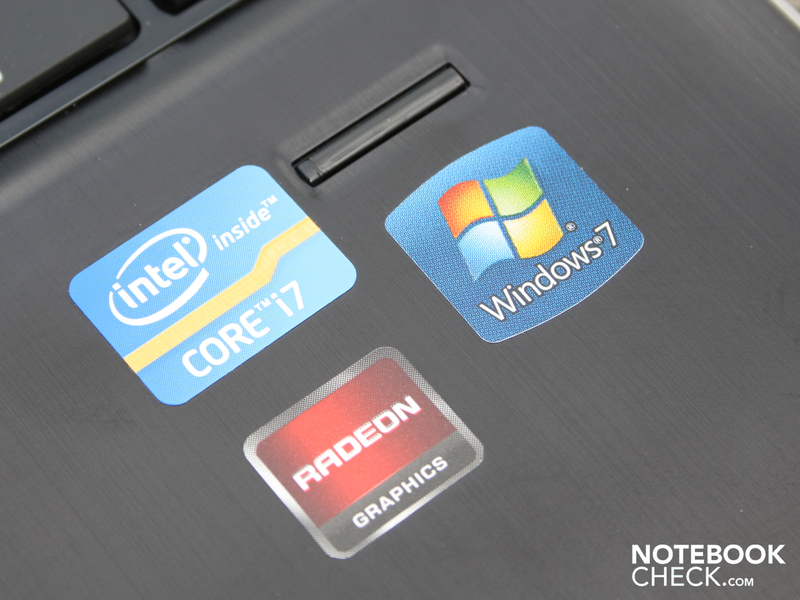 The strong AMD Radeon HD 6770M graphics chip is on board and is probably also the best graphics chip available for notebooks in this price range. The price is hot, and the system and gaming performance is strong. So why did it not score "Very Good" in our test? The spongy keys, the weak and pliant chassis and a few other flaws ruin the otherwise great impression one gets from the notebook - high-quality aluminum hand-rest regions, the display cover, the glossy elements and the speaker panel. The ports satisfy the requirements of modern notebooks (USB 3.0). The system noise can be disturbing, but thankfully the user can use the CoolSense tool to minimize this annoyance. The display loses valuable points as it has a poor contrast, poor viewing angles, and a restricted color space. Finally, the overall performance is affected by the CPU throttling when the CPU and GPU are both under load, and the cooler fan settings is in "Cool" or "Quiet" mode. Gamers will need to use the optimal "Performance" mode. The dv6-6008eg is an attractive packet. The 15.6 inch device lacks a few very important features such as a good keyboard, broad viewing angles, and sturdiness. However, on the bright side, the laptop does offer good hardware for a decent price. Potential buyers are advised to take a closer look at the new HP Pavilion dv6 lineup and see for themselves whether the new models are worth their money. HP Pavilion dv6-6008eg: A gaming all-rounder with lots of power under the hood. But where can one buy this 15.6 inch delight? The HP Pavilion dv6 is available in many different configurations. However, the power usage of 113 W shows that this adapter is necessary. 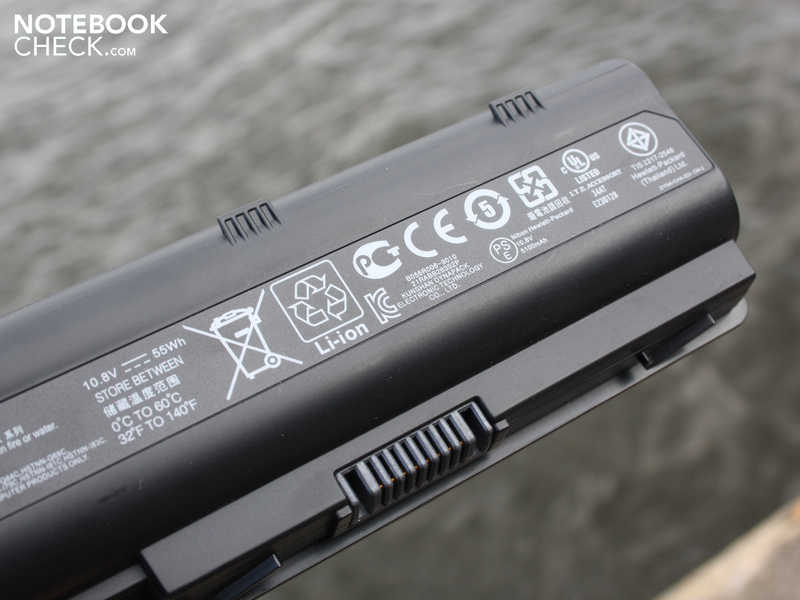 The battery can be taken out by using the single locking mechanism. It has a capacity of 55 Wh which will suffice for 4 hours and 20 minutes of use (WLAN test). HP has made the removal of the bottom plate quite interesting and easy. The battery release mechanism just needs to be pushed outwards to the left (no screws). The hard disk has a capacity of 500 GB and operates at 7200 rpm. This makes the Hitachi HDD faster than the 5400 rpm hard disks in most other laptops. 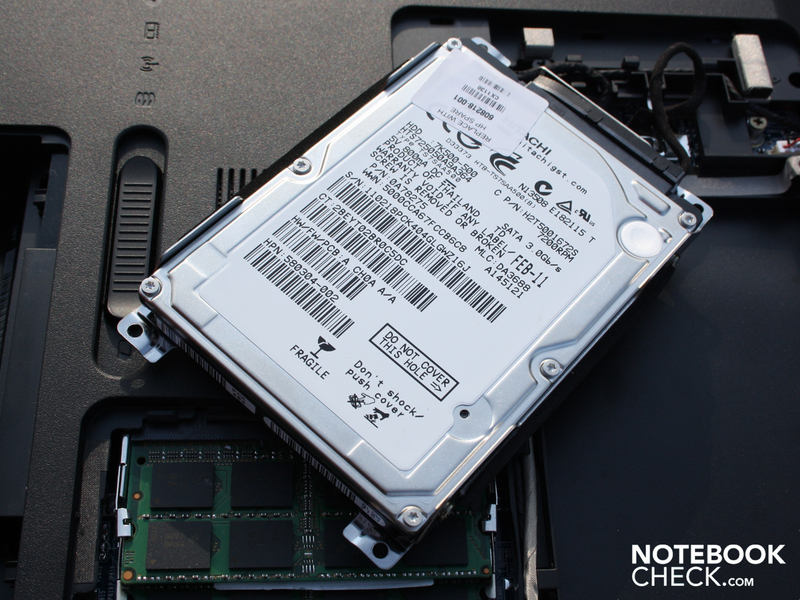 A rubber layer prevents the typical vibrating of the 7200 rpm hard disk. The DVD optical drive can be removed after taking out one single screw. The slot is not a "MultiBay", which means a second hard disk could also be fitted in provided the user has the right frame (standard SATA II). The well-sized RAM of 8 GB, consists of 2 x 4,096 MB. Pavilion dv6-6008eg: Nice design, strong performance but a poor keyboard. 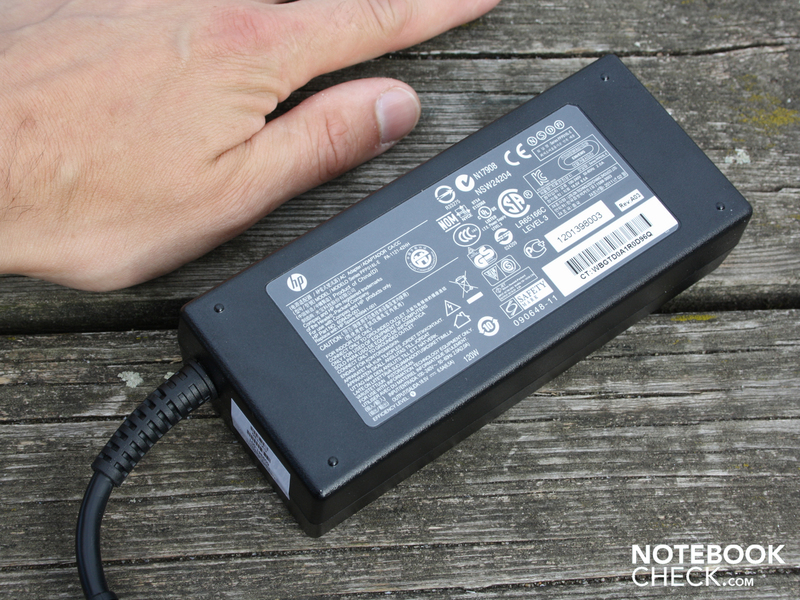 |The heavy 120 W power adapter seems too big when compared to the form factor of the 15.6 inch device. The camera can take photos of 1600 x 1200 pixels resolution (1.9MP). a strong, gaming-capable graphic card: the AMD Radeon HD 6770M. All for a price of 799 Euros. which contradicts the otherwise high-quality impression. The device offers the currently popular multimedia ports. Two USB 3.0 ports are available, but sadly there is no Bluetooth or ExpressCard. The biggest critique would be the spongy, rickety keyboard. Such a poor keyboard has not been in laptops for a long time now. The key surface can be bent inwards easily with the fingers. Any user who wants to work with this keyboard will require a lot of patience. Thankfully, the manufacturer did not use a cheap webcam. Strong laptop graphic available starting from 600 Euros. A sturdier keyboard with better feedback. Even gamers need their keyboards for writing E-mails. Lots of gaming power in a small form factor. An attractive price.